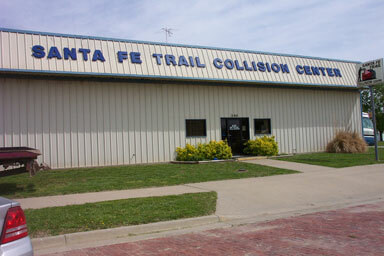 Santa Fe Trail Collision Center is a family owned business located in downtown Burlingame, Kansas. We have 30 years experience in the Collision Repair Industry. Our employee’s have over 85 years of combined experience and are ASE Certified. Santa Fe Trail Collision Center has all of the state of the art equipment needed to repair your vehicle in house. We use web based estimating, which for you the customer means an estimate can be quickly done. Once you have contacted your insurance company, you can bring your vehicle in and within 24 hours we will have the estimate to your insurance company. If your vehicle can’t make it to us, we can schedule a time to do a estimate at the vehicle location. We are looking foward to doing business with you.